Leah Goldin, mother of slain IDF soldier, tells Arutz Sheva the family is now on their own in fight to recover son's body from Hamas. It’s been just over three years since Givati Brigade Lt. Hadar Goldin was killed while fighting the Hamas terror organization in Gaza. Hadar’s mother, Leah Goldin, has been counting the days. Hamas terrorists took the bodies of Hadar and Sgt. Oron Shaul hostage during Operation Protective Edge, demanding Israel free terrorists in exchange for their return. While three different coalition governments led by Prime Minister Binyamin Netanyahu have promised their support for the Goldin family’s efforts to secure the return of their son’s remains for burial in Israel, little progress has been made. In fact, in recent days it appears that the family has been all but abandoned, Leah Goldin told Arutz Sheva following the resignation of chief negotiator Lior Lotan. 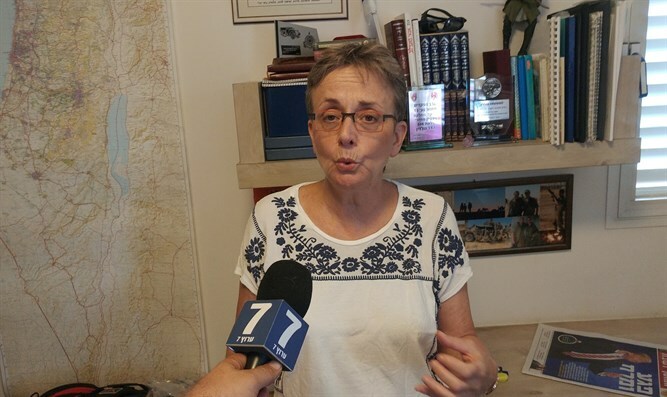 On Sunday, Mrs. Goldin spoke with Arutz Sheva about the prospects for the future of her family's struggle, in an interview held in what had been Hadar's room prior to his death. "We are three years and three weeks after the incident [in which Goldin was killed], and yes, we are still struggling. What is special today is the crisis we went through since last Thursday, when the negotiator Lior Lotan actually resigned from his job, which means that we are now by ourselves. We have to do our own campaign, our own fight, our own discussions against politicians and against our government, which is very frustrating." "We are now three years after the incident, so a lot of things could have been done up till now to get Hadar and Oron (Shaul) back [for burial in] Israel." Despite the setbacks, Mrs. Goldin is as determined as ever to bring her son’s remains back home – and to end the Hamas terror organization’s use of slain Israeli soldiers as bargaining chips. “We, Israelis, need to define the price for Hamas for holding the Israelis' bodies - soldiers' bodies - and for kidnapping in the first place. Defining a price for them [means] putting pressure on them. Because we now know that the whole world is struggling to rebuild Gaza and Israel is highly involved in the humanitarian aid to rebuild Gaza by [bringing in] materials and receiving people from Gaza to get medical treatment and a lot of things. We keep saying this must be linked to the fact that they hold our soldiers." Thus far, however, the government has taken few practical steps to adopt the policy advocated by the Goldins. The government's response, said Mrs. Goldin, "is so fake... just look for yourself," citing the example of Israel's continued transfer of electricity to Gaza, despite the Hamas organization's continued aggression against Israel and failure to pay for the electricity it receives. "The Prime Minister used to say, 'If we turn off their electricity, they will shoot missiles, they will die of disease.' But look what happened when Abu Mazen [Mahmoud Abbas] asked to turn off their electricity because they don't pay. Nothing happened. So now this is proof that nothing would happen. I think that our leaders, unfortunately, lack some basic courage to [enable them to stand their] ground."